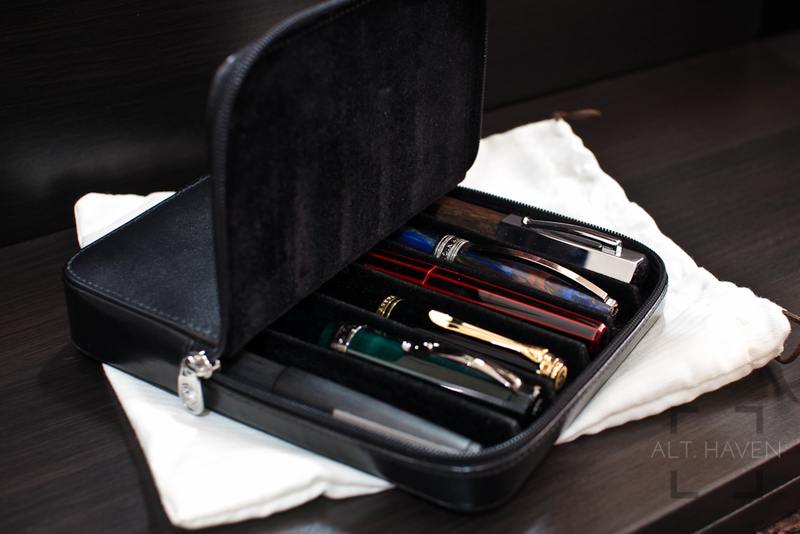 My thanks to my good friend Gautam for lending me his pen case for review. Visconti is a company known for their flashy Italian manufactured fountain pens. Personally I am very enamoured with the Visconti Divina Elegance. My personal “hit list” aside, Visconti also makes pen holders. They come in 1, 2, 3, 6 and 12 pen slots. In this case, I am reviewing the 6 pen holder here. Visconti’s pen holders come in only one colour option and black is the colour of choice for Visconti. 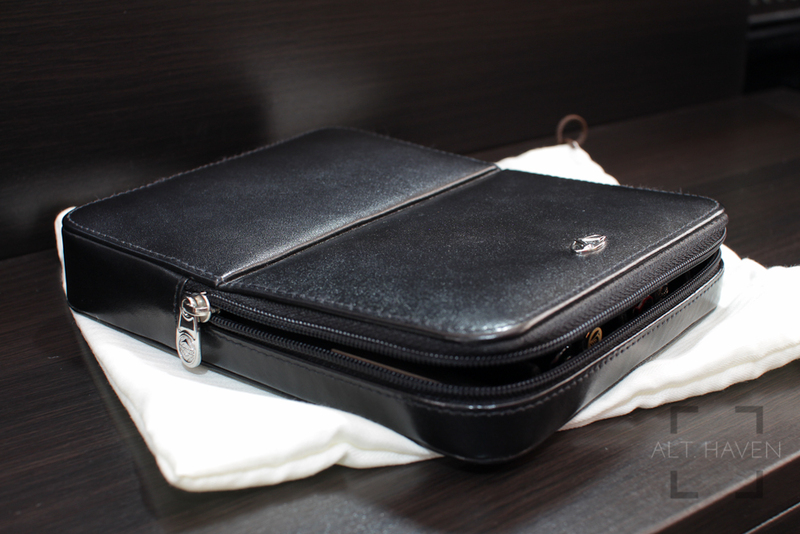 The Visconti Dreamtouch Leather 6 Pen Holder comes in a cotton draw string bag. A bag to protect your pen holder which protects your pens. Protection-inception! The pen holder is made of Italian leather which feels soft and cushioned to the touch. The entire pen holder is very well made and the leather feels high quality and luxurious. The front is accented with a silver coloured Visconti’s V logo and the back has the traditional Visconti bridge logo stamped. There is a zipper going half way down the length of the pen holder. The zip moves easily and smoothly along its tracks. The top 3/5 turns into a flap, which is hinged using stitching and a fold in the leather. 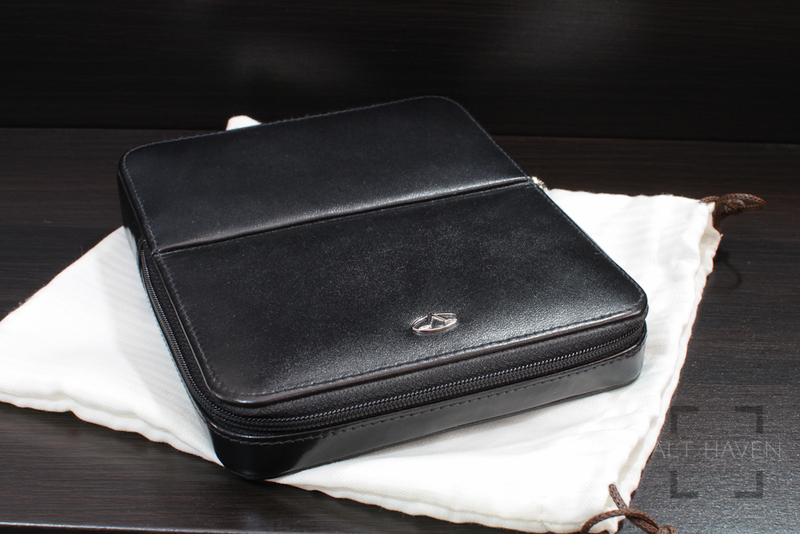 Inside the pen holder, the interior is lined with a black velvet like material. This soft lining covers the inside of the flap and it runs down the entire length of the pen holder. The dividers inside the pen holder is stiff and rigid but also lined. The width of each individual pen slot isn’t equally spaced. The two slots on the sides are wider than slots in the middle. The widest pens I owe are the Delta Dolcevita Stantuffo and OMAS Arte Italiana. Both fit inside the middle slots of the pen holder, some more easily than others. Length-wise, the pens have at least an additional 1.8cm of head room. Personally, I prefer to keep the wider pens on the side slots where it is roomier and the slimmer pens towards the middle slots. The slimmer pens do tend to rattle around inside their individual pen slots because of the space it has inside. However the lining gives me the ease of mind that the pen wouldn’t pick up additional scratches inside the pen holder. Unlike the Franklin Christoph Penvelope 6 which I’ve reviewed earlier, the Visconti Dreamtouch Leather 6 Pen Holder handles pens of all lengths easily. The flap allows you access to a good portion of the pen. Even if you have a short pen like a Pilot Myu 701 inside, you can get your pen easily. Some users have expressed concern regarding the zipper tracks scratching up the top of the pen caps inside the case. Personally after using it for 2 weeks, I didn’t spot any additional scratches to the top of my pens. However, these users have remedied the situation with a soft cleaning cloth lining the top of the pen case. It’s a smart solution plus you have a cleaning cloth for your pens if you need it. Overall, I enjoyed the Visconti Dreamtouch Leather 6 Pen Holder a lot. It is a well designed product with a premium price tag to match. I feel it is an appropriate price for the quality pen holder you get.